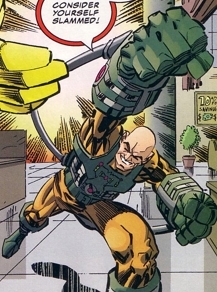 Weapons: The Slammer wields a pair of energy gloves along with a harness that constructs powerful force-fields or generates deadly force-beams. NOTE: The Slammer created by Erik Larsen, with help from Gary S. Carlson and Mark Englert. The Slammer was a super-powered bank robber that mercilessly killed people in order to escape capture by Mighty Man II. When Billy Berman stole the powers from Ann Stevens, he used the Mighty Man abilities to target numerous supervillains. The Slammer was one of the first to fall before his merciless war on crime.